Fee: £950 10% Early Bird discount available for a limited period. Breaking down your first feature as a Script Supervisor is scary. So is breaking down your second feature. Creating the timeline for the story, doing the page counts, and script changes memos require craft, practice, finesse, and knowledge of the production process. In order to do a great job, the script supervisor must collaborate with department heads and the director to come up with the most streamlined and best plan to serve the story. Once production starts, every day is a race. The prep period is the calm before the storm. It’s our chance to get inside the script and get it inside us, so that we can ride the changes as they come and keep everyone on board. Getting the most out of prep is an essential part of being comfortable and helpful on set. In this course, we will use a case study script in order to look at the process in an in-depth hands-on way. Over the five days, we will go through each phase of breaking down the script, as well as covering other areas the Script Supervisor is responsible for in prep. Each participant will be breaking down the case study script for themselves, and generating their own paperwork, as if they were prepping to shoot this feature. From first read through to showing up for the first day of the shoot, participants will work individually and in groups to create breakdowns, page counts, and script timings and get set-ready! What does a Scripty look for? Timing; Page count; VO List; Continuity Notes. Using paperwork to insure the Director’s Vision. Interfacing with departments in prep. Script Revisions: Script Changes Memos; Using Final Draft; Scene numbering; Keeping track of drafts. The night before the first day of the shoot. This may be the single most important task of the script supervisor in prep. The Story Day Breakdown, Day/Night Breakdown, Timeline – whatever you name it – is the inner chronology of the film you are making from the blueprint of the script. All departments engage with this document. The timeline must represent the director’s vision for the movie, while adhering to production’s needs. Participants will be working individually and together to create a Story Day Breakdown for the case-study script – from conception through to document stage. These are two important, and time-consuming aspects of prep. Done well, these will assist the script supervisor and the AD’s, director and producers to envision the work to do, and the pace and flow of the movie. Both take practice and precision. Using the case-study script, participants will create page counts and pre-timings. All the information tracked by the script supervisor must be put into documents (or a database or spreadsheet), many of which are made available to department heads and keys. Participants will create their own documents, either digitally, from examples, or templates, and add in the information they are tracking during prep. Some documents include the Story Day Breakdown, Script Supervisor’s One Liner (or Breakdown), Continuity Notes, Voice Over List, Clearance Memos, Script Revisions Memos. Participants will learn about departmental responsibilities and information flow in prep through discussions and group exercises. They will gain a clear picture of who requires which information and a working model of how to negotiate the concerns of multiple departments in pressure situations. The initial production meeting and rehearsal process will also be explored. Script revisions happen. To nice people. They are no picnic. 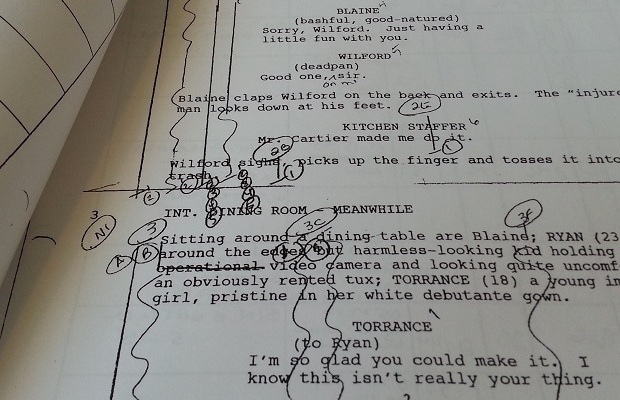 The script supervisor is responsible for literally keeping the entire cast and crew on the same page. Hands-on exercises using the case-study script will illustrate areas where challenges arise and help create a method of understanding and troubleshooting revisions in the fast-paced run up to production. Memos will be created, drafts tracked, scene numbers double-checked, and the use of Final Draft explored. Whether you use paper, an iPad, digital software, an Excel spreadsheet, each Script Supervisor has to find the system that works best for them, while still being able to share information widely in a clear, concise manner. Participants will explore different options and will be able to choose the methods by which they create their paperwork in class. Examples and templates will be available. The course will finish with a screening of the completed movie of the case-study script and comparing participants’ decisions with the final product. On-set experience of any nature on a narrative short or feature and an understanding of the feature production process, set etiquette, departments, and departmental responsibilities. Successful completion of Beth Multer’s 2-day introductory continuity workshop at LFS (or equivalent course elsewhere). On-set experience as a script supervisor on more than one short film, or on a feature. On-set experience as a department head in another department. Those with experience in post-production only will be assessed on a case by case basis. Additionally, applicants should understand that this is an advanced and focused course and is not meant to teach the scope of the work of Script Supervision and Continuity, but rather to give hands-on practical experience in breaking down and prepping a feature film as a Script Supervisor. Issues regarding production will only be addressed as they relate to the work delineated in the course. All participants must have a familiarity with reading production paperwork. If you have any questions about this course, its requirements or about your application, please get in touch at workshops@lfs.org.uk. For lots more feedback on Beth's workshops at LFS, check out her 2-day course: Script Supervision and Continuity for Film & Television. It was great to be a part of the course. I learned so much. Beth is a great teacher…I feel more confident in myself after taking this workshop. I really enjoyed the course and I found it really informative and very encouraging. I can't wait to start on something soon so I can apply what I have learned into practice. Thanks a lot for this workshop, I learned exactly what I was looking for. I look forward to your book now! I truly enjoyed the course and found it utterly useful and fun, now I'm even more excited about script supervising and I feel much more confident about it. I am very happy to have taken this workshop!